Where do I use my myParcelDelivery voucher code? Back in 2009, a Post Office customer, David Grimes was tired of queuing times, waiting around for parcels to be sent and orders be fulfilled. It was at this time that inspiration struck David Grimes and the idea for Parcel Delivery was created! With the logic to create a service which was simple, quick and hassle-free, David thus created My Parcel Delivery which has now become everything he initially envisioned. Since 2009, the company now proudly organise and facilitate the delivery of over one million parcels a year on behalf of 100,000 customers via 14 different couriers to over 200 countries. Once you have made your booking with My Parcel Delivery, the helpful team are there to assist you every step of the way and take responsibility for their services. If you need to speak to a member of staff regarding any aspect of your order which can’t be cleared up online, just simply get in touch. The customer service team is always on hand and happy to assist you all the way. With My Parcel Delivery, you can pay prices up to 78% cheaper than you would pay with Royal Mail. Not only is it cheaper but there is wide choice of convenient options making the process more simple for you. The Parcel Delivery courier partners will collect your parcel from your home or work, or alternatively, there is a selection of drop off points where you can leave your parcel. There are no ques or closing times like there is at the Post Office either. With My Parcel Delivery, you can sleep soundly knowing your parcel is in safe hands and you’re getting the best possible service and price! Check out the price comparisons here. Parcel deliveries, specifically international shipping can usually cost a small fortune, especially with the likes of The Royal Mail. My Parcel Delivery promise to beat the prices offered by any other service and with the added bonus of one of our My Parcel Delivery Discount Codes, you could save even more on your next service! When sending a parcel overseas, some people believe it to be quite tricky. However, with My Parcel Delivery, it couldn’t be any less hassle. The team will take care of everything for your making your international parcel delivery as simple as possible. Delivering to over 200 countries, it’s almost certain you can have your parcel delivered to your desired destination! You also receive up to £30 free in compensation cover and enjoy the convenience of having your parcel collected by a courier either from your house or your workplace. You don’t have to pay a fortune either, prices are as little as £16.99+ VAT. You can save even more on International Delivery with a Voucher Code courtesy of us here at NetVoucherCodes and ship you parcel across the seas for an unbeatable price. Choose My Parcel Delivery for all your parcel needs, especially International ones. With every delivery, you can track your parcel every step of the way from collection to delivery and it couldn’t be any simpler. Once you have booked your delivery with My Parcel Delivery, you will receive an email providing you with an MPD booking reference number. Simply input this unique number into the box provided on the Track My Parcel page and you can locate exactly where your parcel is in no time. Find your reference number and start searching now! Delivery prices vary depending on what day and time you would like your parcel to be delivered, for all delivery details and to get a delivery quote the delivery section. 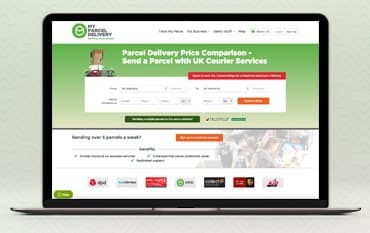 With My Parcel Delivery, Parcel Comparison costs are made simple! Choose from a wide selection of courier services which can deliver to over 200 countries. Save up to 75% off when you compare prices online opposed to going directly with Royal Mail. Sending a parcel has never been easier or more hassle-free than with My Parcel Delivery. Whether you’re selling goods on eBay or are a small business needing to ship items, however big or small your order is, My Parcel Delivery is able to assist. You can save on your shipping costs too with a My Parcel Delivery Promotional Code found here on our NetVoucherCodes deal page.